If you notice that search performance in Novell Vibe is becoming slower over time, you might want to optimize your Lucene index. For a medium to large Vibe system, it is recommended that you run the optimization once a week. You should run the optimization during off hours or on weekends when the Vibe system is not being heavily used. Optimizing the Lucene index does not repair a damaged or out-of-date index. To repair a damaged or out-of-date index, you must rebuild the index, as described in Section 26.4, Rebuilding the Lucene Index. Under Management, click Search Index. 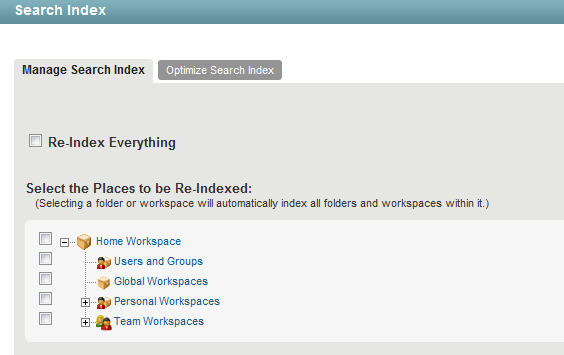 Click the Optimize Search Index tab. Select Run Immediately if you want to run the optimization right now. Select Run at Scheduled Time, then specify the days and times that you want the optimization to occur. Select each node that you want to optimize.